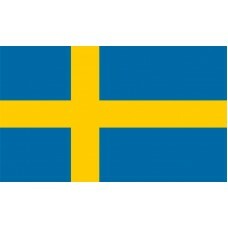 The Swedish flag consists of a blue field with a yellow Scandinavian Cross. 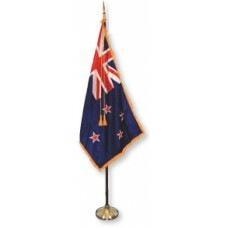 The vertical part of the cross is more towards the left side of the flag and not in the center. 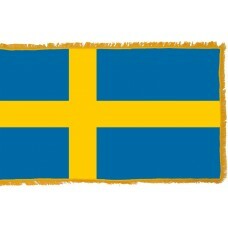 It is thought that the Swedish flag was inspired by the Coat of Arms. The cross on the flag was taken from the Danish flag and the blue and yellow colors have been the traditional colors of Sweden. According to Swedish legend, during the First Swedish Crusade in 1157, King Eric IX saw a golden cross in the sky which he saw as a sign from God and took these colors as the colors of his banner and the colors have remained the Swedish colors since then. According to other historians, the Swedish flag was blue with a white cross on it until 1420 and the reign of King Gustav I. The first legal description of the Swedish flag that included the colors yellow and blue was made on April 19th, 1562 as "yellow in a cross fashioned on blue." Sweden is a country that is located in Northern Europe and shares borders with Norway, Finland, and Denmark. Sweden is thought to be the third largest country in Europe, yet the country has the lowest population. The largest and capital city of Sweden is Stockholm. Stockholm is also referred to as the "Venice of the North" as the entire city has been built around water and consists of 12 islands and 42 bridges. It is also considered to be one of the most beautiful cities in the world due to the centuries of history and culture that it contains. In 1387, Sweden joined with Denmark and Norway and became part of the "Kalmar Union" which was ruled under a single monarch. The union was between 1397-1523. During the union, however, there were plenty of conflicts and battles which resulted in the "Bloodbath of Stockholm" in 1920, where 80 Swedish Nobles were executed at the hands of the Danish King. The bloodbath caused a major rebellion and on June 6th, 1523, Sweden became a separate country and Gustav Vasa was appointed as King. Following their independence, there were many wars and battles fought with Denmark for control of the Baltic Sea, which resulted in Sweden being defeated. Sweden is the seventh richest country in the world. The main contributor to the economy is export, mainly of timber, hydropower, and iron. Tourism also contributes to the economy and the most popular tourist destination that attracts over one million tourists a year is the "Vasa Museum." The Vasa Museum is home to the Vasa battleship which sank in 1628 on its maiden voyage. The ship was salvaged over 30 years later, in 1961, and is now displayed in the museum. Another main attraction is the "Fairytale Drottningholm Palace" located on the island of Lovo which is the official residence of the Royal family. 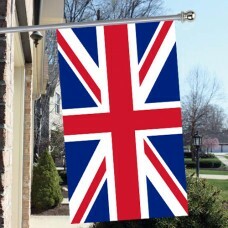 thy banner, full of feats, carry high. No, I want to live I want to die in the North.